While I was working at the Melbourne Craft & Quilt Fair it was lovely to catch up with some friends and make some new friends too! 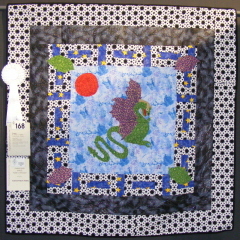 What was even more special was finding out that there were some very clever kids that I know who had entered some of their quilting creations into the Show. Congratulations to the trio of talented “new quilters”. (Watch out Mum’s!!) All three were Highly Commended in their field and have lovely white ribbons to show for it. CONGRATULATIONS!!!! 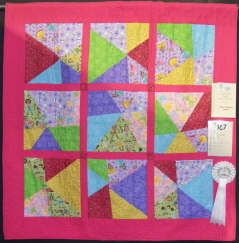 This quilt belongs to Hannah – Well Done! I can’t wait to see your next quilt. A fantastic effort Madeline! Keep up the great work! 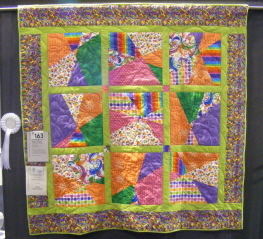 We have some very talented and creative young people making the quilting world an exciting place to visit. 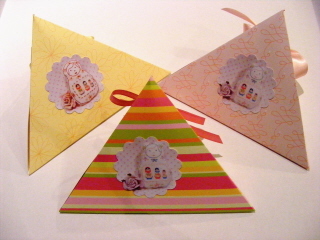 Here is a cute little kit that will soon be available on my website. She is a little brooch standing around 8cm tall. 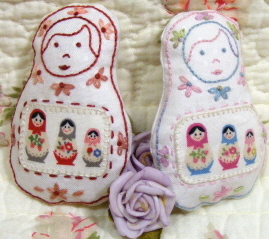 The kit contains the fabric, applique matryoshka fabric, thread, brooch pin & instructions. There are two colour versions – blue/pink/purple version or the more traditional rusty red/peach version. It comes packaged in a little triangular box, that will be flat packed for postage (sorry, otherwise it will be crushed in transit). So if you are giving it away as a gift all you will have to do is put it together and place the kit inside. Packaging colours will be randomly chosen. She is very quick to stitch and can be made in an evening. How time flies!!! Am I having fun? Well, I am still here. Am I having fun? Yes, in amongst life’s crazy little ups and downs. It is hard to believe that I have not posted in such a long time, however work committments have had to come first given that I am now keeping my husband in the manner in which he is becoming accustomed! Although I can’t complain about some of the housework being done. It has been very busy, with travelling to Sydney for the Craft & Quilt Fair in June (working on the Universal Magazine stand) and have just finished working the Craft & Quilt Fair here in Melbourne. In between these 2 shows there has also been a daughter with a fractured arm (now in plaster). I guess an ice skating career is definitely not on the cards and I have also had lots of therapy sewing on sequins for her dance competition back in June (or should I say need therapy!). Anyway I’m back on board, still with lots of work planned but a new little project which will soon go on my website. Stay tuned.